Just mix, pour and bake this reduced-sugar version of classic pumpkin pie, a sensible choice for those on restricted diets. Mis Splenda® Sugar Blend for Baking, salt, cinnamon, ginger and cloves in small bowl. Beat eggs in large bowl. Stir in pumpkin and sugar-spice mixture. Gradually stir in evaporated milk. Bake in preheated 425°F (220°C). oven for 15 minutes. Reduce temperature to 350°F (175°C); bake for 40 to 50 minutes or until knife inserted near center comes out clean. Cool on wire rack for 2 hours. Serve immediately or refrigerate. Top with whipped cream before serving. 1 3/4 teaspoons pumpkin spice may be substituted for the cinnamon, ginger and cloves; however, the taste will be slightly different. Do not freeze, as this will cause the crust to separate from the filling. 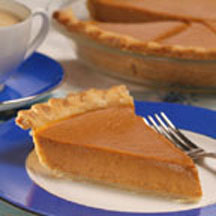 For 2 Shallow Pies: substitute two 9-inch (2-cup volume) pie crusts. Bake in preheated 425°F (220°C) oven for 15 minutes. Reduce temperature to 350°F (175°C); bake for 20 to 30 minutes or until pies test done.